Norwegian connects the City of Lights to the Mile High City with new service from Denver to Paris with an introductory fare of $229 one-way including taxes. 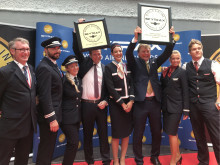 Norwegian reached a new milestone in June, flying more than three million passengers in one single month. Since Norwegian first started flying in 2002, the airline has now carried over 200 million passengers. 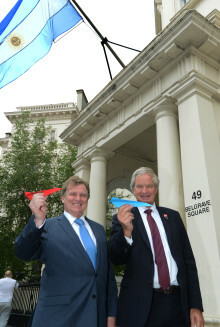 Norwegian, the World’s Best Low-Cost Long-Haul Airline for the third consecutive year and Europe’s Best Low-Cost Airline for five consecutive years, today announced it will commence service from both Austin and Chicago to London and it will add new routes from Boston and Oakland to Paris. 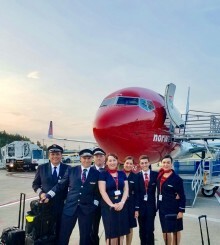 Norwegian, the World’s Best Low-Cost Long-Haul Airline for a third consecutive year and Europe’s Best Low-Cost Airline for the fifth year in a row, today took delivery of two of its 110 737 MAX-8 aircraft on order from Boeing. The airline will take delivery of an additional four MAX aircraft this year. 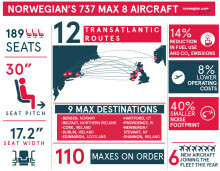 Norwegian has launched its highly-anticipated Boeing 737 transatlantic service, with the first route to Edinburgh, Scotland, from Hudson Valley’s Stewart International Airport in Newburgh, just north of New York City. Flights from Providence, Rhode Island, and Hartford, Connecticut, will follow on June 16 and 17, respectively. Norwegian’s latest nonstop flights out of the United States have taken off this week. The new routes from the World’s Best Low-Cost Long-Haul Airline and Europe’s Best Low-Cost Airline are from Los Angeles, Newark and Oakland to Barcelona in Spain, followed by flights from Fort Lauderdale to Barcelona in August. Norwegian carried more than 2.9 million passengers in May, an increase of 11 percent compared to the same month previous year. The load factor was 86.5 percent. Norwegian today announced it will launch nonstop service to Guadeloupe and Martinique from Providence’s T.F. Green Airport beginning in October. Additionally, Norwegian is increasing its service to the French Caribbean from Fort Lauderdale to three weekly flights to Guadeloupe and adding a new route to Martinique with thrice weekly service for the 2017/18 winter season.